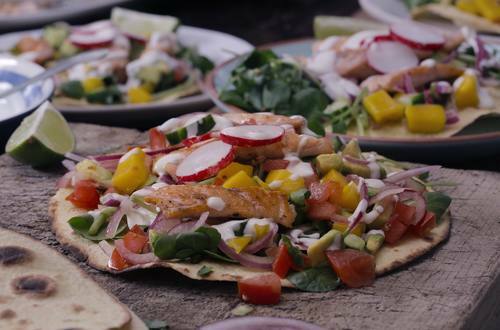 Delicate trout meat is the perfect accompaniment to light tacos. Add to that, cucumber, avocado & mango plus the peppery crunch of radishes. 1 Mix the chopped cucumber, tomato, avocado, mango and chilli in a bowl. Add the juice of one lime and toss gently. 2 Finely slice the red onion. Place in a bowl and cover with the juice a second lime. 3 Roughly slice the radishes and set aside. 4 Heat up a frying pan over medium heat. The pan is hot enough when the tortillas puff up slightly. 5 Dry fry for one minute on each side. Once reheated, keep them warm inside a napkin. 6 Heat a grill pan on high. Season the slices of rainbow trout and lightly brush with oil. Place on the grill skinned side up and cook for 1 ½ minutes to 2 minutes, depending on the thickness. If the grill is hot enough, the fish won’t stick to it. Cook them only on one side to keep them moist. 7 Fill the tortillas with watercress, salsa and fish fillets. Garnish with radish slices and a drizzle of mayonnaise. Serve at once with coriander and lime wedges.